Beginning this week mortgage lenders will discontinue processing loan modifications for struggling homeowners in southeast Virginia. This dire decision is just one of many consequences of the recent government shutdown that have financially struggling homeowners scrambling. Many of the affected homeowners in southeastern Virginia are already not drawing paychecks due to the shutdown. The decision comes in part because government agencies such as the IRS, Social Security and FHA, who are involved in the process of loan modifications are closed. A key element to a loan modification packet is providing the ability to verify income through the IRS tax filing. 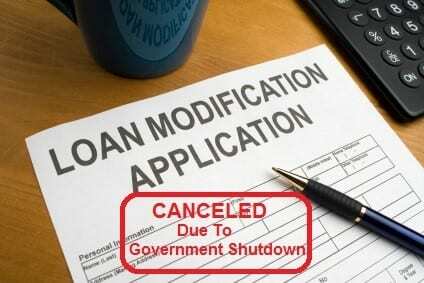 With the IRS closed, mortgage lenders are unable to obtain this documentation. In the Richmond area, people employed on installations like Fort Lee and for agencies like the Federal Reserve and many smaller federal government locations are waiting at home without a check to see when the budget impasse will end. The shutdown has had a more significant impact in the Tidewater area where employees on government installations in Newport News, Williamsburg, Portsmouth, Norfolk, Chesapeake & Virginia Beach idly wait for news to return to work. The Washington Post reported today that this unfortunate consequence of the government shutdown could not only undercut the reviving housing market but put thousands in our region on the path to foreclosure. The impact of the shutdown is even more far reaching and will extend to disrupting new home purchases dependent of documentation from the government or loans underwritten by the government. Section 8 landlords will not receive payment from HUD due to this shutdown. This threatens not only the financial stability of the landlord but also the tenant who could be faced with eviction is payment is not make. Stripped of the ability to process loans, mortgage lenders will undoubtedly have no choice to proceed with foreclosure if the shutdown goes too long. As a result, local bankruptcy attorneys anticipate an increase in Chapter 13 filings in the next few weeks. How large an increase we will see in the coming months will depend on how long the government shutdown continues. If you are in the middle of a loan modification or are out-of-work due to the shutdown, Merna Law is offering free financial planning consultations to navigate the coming financial crisis most will face in hope of avoiding bankruptcy. Call 800-662-8813. The Merna Law Group assists struggling homeowners to save their property from foreclosure using the bankruptcy protection of a Chapter 13. We have offices located in Richmond, Newport News & Virginia Beach.